Secretary of Defense Chuck Hagel canceled the final stage of a Europe-based U.S. missile defense system on Friday. The Pentagon claimed that the decision has nothing to do Russia, but Hagel has long advocated reducing missile defense capabilities in Europe as a means to increase cooperation with Russia and it has been reported that the Obama administration is attempting a second reset with Russia. We watched the president state to Medvedev that he would have greater flexibility after the election. Putin later announced the terms of the agreement. You’d have to conclude that there was a deal. … The president clearly has abandoned the shield that the Russians opposed and we’re left with the U.S. having greater exposure to North Korea and Iran without any Benefit. 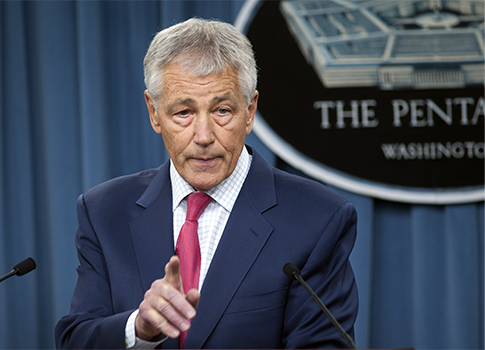 A long proponent of closer U.S.-Russian relations, Hagel first spoke out about the need to base missile defense policy around Russian concerns as a senator in 2000 when he endorsed the decision by the Clinton administration not to deploy a limited national missile defense system. [Missile defense] cannot develop in a vacuum … [it] must move forward on a four parallel tracks—technology, Congress, our allies, and the Russians. But I question if provoking Russia with a missile defense system position on its borders … that has dubious utility to American security, will do anything but … further erode our relationship. Heading the Commission On U.S. Policy Toward Russia, Hagel illustrated how far the U.S. should go in cooperating with Russia on missile defense. Building a joint system that could include Russian facilities and equipment is most desirable. … At a minimum, the United States must seriously address Moscow’s concerns that the system could be directed against Russia. Hagel’s willingness to use missile defense programs as a bargaining chip with Russia appears to coincide with Obama’s objective of "resetting" U.S.-Russian relations. Many saw Obama’s decision not to deploy parts of the missile defense system to the Czech Republic and Poland as components of that "reset." According to the New York Times, within the White House the first "reset" is seen as a failure, requiring a second "reset" in Obama’s second term. This entry was posted in National Security, Politics and tagged Barack Obama, Chuck Hagel, Congress, Mike Turner, Missile Defense, Obama Administration. Bookmark the permalink.